Approval Procedures for Fieldworkers travelling to High Security Risk Areas. Our Duty of Care necessitates that we monitor carefully the movements of our fieldworkers and restrictions that apply to areas of High Security Risk. The warnings issued by the Australian Department of Foreign Affairs (DFAT)’s Smart Traveller website. It is recommended that all Regional Secretaries and Area Team Secretaries access the DFAT website smartraveller.gov.au and arrange for automatic emailing of updates for their specific areas. The ACBM uses the same four Security Warning Levels as DFAT. These warnings may apply to a country or to a specific area within a country. Please refer to smartraveller.gov.au/countries/ for up to date status of countries and areas within countries. Level 3 and Level 4 are both considered “high security risk areas”, and require specific additional approvals before ACBM fieldworkers can enter these areas. Except in the case of emergency or crisis, at least one month’s notice must be given prior to any commitment, either financial or otherwise, being undertaken. In the case of emergency or crisis, full additional justification warranting travel is required. If the warning arises after normal Regional Committee approval, or if fieldworkers are already in the field, the National Fieldworker Safety Officer should be advised immediately and the fieldworker information required forwarded without delay. A proposal should be developed detailing the area, justification for why the fieldworker must go now, the experience of the fieldworker in the area in which the travel will be undertaken, the expected time in the high-risk area, and any other relevant information. Supporting information could be obtained from local brothers and sisters, past fieldworkers, and/or other credible information sources to support the trip and the risk associated with it. Following Area Team approval, the Area Team should submit details to the Regional Committee. 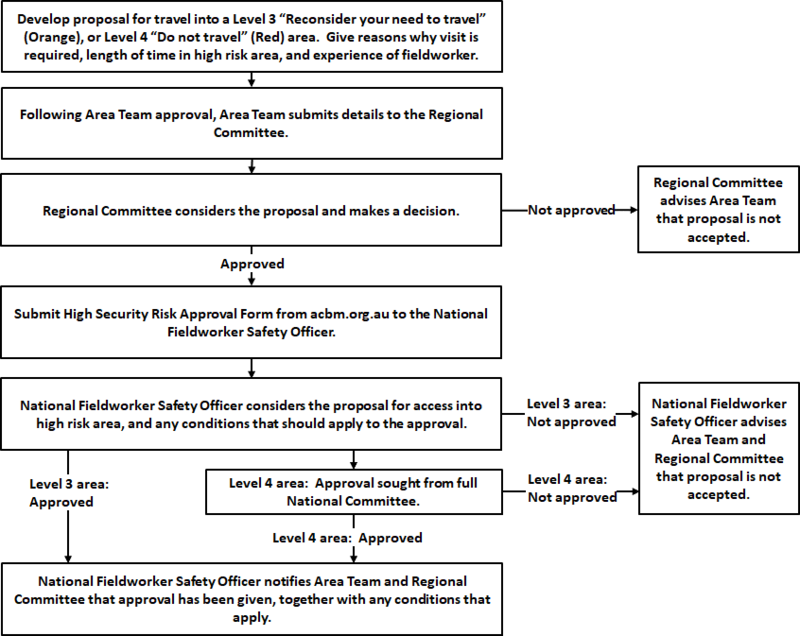 Once approval is given by the Regional Committee, the High Security Risk Approval Form should be submitted via org.au for approval by the National Fieldworker Safety Officer. The National Fieldworker Safety Officer will approve travel into Level 3 areas on behalf of the National Committee. Travel into Level 4 areas requires approval by the full National Committee. Conditions such as mandatory reporting by fieldworkers to Area Teams at least weekly while in a high risk area will be specified, and should be complied with by the fieldworker.